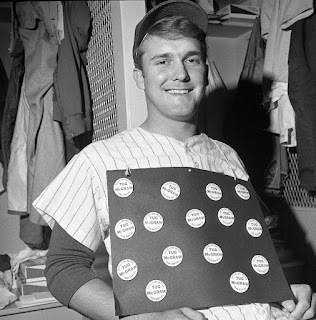 Sunday August 21st, 1966: Wes Westrum’s ninth place New York Mets (55-69) visited Connie Mack Stadium in Philadelphia to face Gene Mauch’s fourth place Phillies (67-57). 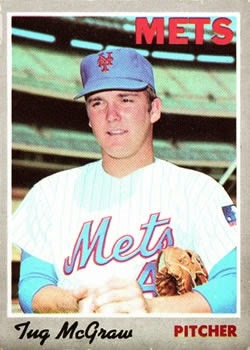 The Mets starter that day facing Philadelphia's Jim Bunning, was a young Tug McGraw, who was in his second MLB season. Tug would start 12 of the 15 games he pitched that year & this game was to be his best outing of the year. In the home 3rd; Jim Bunning the opposing pitcher, drove a single to right field. In the 5th Harvey Kuenn led off with a base hit, those would be the only hits McGraw allowed on the day. After Kuenn's hit, Jim Brandt would reach on an error & Bill White would hit a sac fly bringing in the Philadelphia lone run. McGraw struck out three & walked just one. In the 6th as the Mets were down 1-0, Bud Harrelson started out with a walk. Chuck Hiller singled to center with one out & Larry Elliot then doubled, bringing in both runrers, as the Mets went ahead 2-1. The score stayed that way until the 9th, with two outs Ed Kranepool singled & Al Luplow walked. Eddie Bressoud greeted the new pitcher; Terry Fox with a base hit bringing home Kranepool. Jerry Grote then doubled making it a 5-1 game, sealing the win. It was just the second win of the year for Tug McGraw, who began the season with New York, but was sent back down to the minors from May 17th to August 16th. He would go 2-9 on the year with a 5.34 ERA in just 15 games. 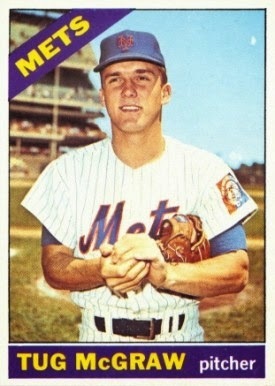 In 1967 he would pitch just four games with the Mets & play all of 1968 in the minors. In 1969 he arrived for good going 9-3 with 12 saves.